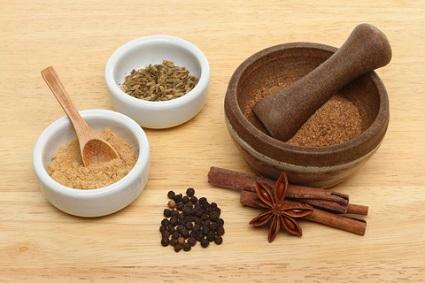 As you might guess, Chinese five spice powder is used in Asian dishes. This seasoning gem can bring out a variety of flavors in your Asian cooking because the powder itself encompasses five tastes: sweet, salty, bitter, sour and pungent. It adds a bit of kick to your cuisine and gives it that authentic, Chinese taste. To make this spice blend, mix equal portions of each spice. If you store the spice mixture in an air-tight container, it will keep for a few years, so you can make as much as you think you'll use. If you don't love all the spices in your recipe, or you want to adjust it to make it more pungent or more sweet, you can do so by substituting one spice. Note that you cannot substitute the Sichuan peppercorns without altering the dish too much. Star anise tastes like licorice, but has a bitter undertone. For a slightly sweeter spice, you can substitute allspice. Cloves add a pungent-sweet flavor to the overall spice. You can substitute allspice for cloves. Alternatively, if you want the clove taste stronger in your spice, buy whole cloves and use a food processor to make powder. Chinese cinnamon also brings a sweet quality to your spice mixture, but it also offers it that bit of 'bite' that you sometimes taste in spicy Chinese dishes. In this case, the best substitute for cinnamon is ginger or cassia. However, some recipes have been known to also use Mandarin orange peel, cardamom or turmeric as substitutes. Fennel seeds taste like licorice and give the spice mixture that distinct undertone. You can add more star anise if you love the taste or licorice root. You can also substitute with garlic powder. While garlic will change what the Five Spice mix tastes like, it will not detract from the flavor of your dish or take away that distinct 'Asian' flair that Five Spice powder lends to food. The most obvious place to use this spicy-pungent powder is in your Chinese cooking. Stir fry makes an excellent canvas for the various flavors of this versatile seasoning. 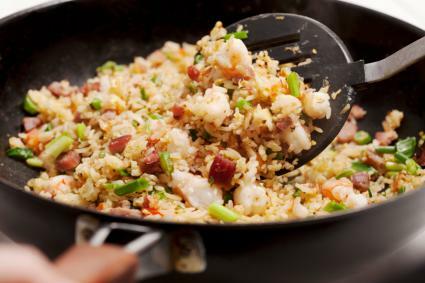 Fried rice is one of the easiest Chinese dishes to make, and it usually turns out well. You can often use leftovers, and although there is a lot of chopping in the prep work, most people find it a satisfying meal. In a medium-size saucepan, bring the water and broth to a boil. Stir in the rice, cover and cook on low heat for approximately 15 minutes. Rice should be fluffy and sticky, and the water should be gone. Remove from heat and fluff the rice with a fork. Heat another tablespoon of oil in the skillet, add the eggs and scramble. When the eggs are done, push them aside in the same pan. Add the remaining two tablespoons of oil, lower the heat to medium, and add the vegetables. When the vegetables are done, add the cooked rice, pork and soy sauce. Cook until heated through and serve immediately. Surprisingly, there are a lot of foods to which you can add five spice powder. Get adventurous and try one of the following suggestions. Barbecue - Add the powder to your barbecue sauce before you begin grilling. Ribs are especially tasty this way, although the powder will give any barbecue a little kick. Fried chicken coating - Mix the powder with flour, salt and pepper, and coat chicken legs and deep-fried them. Basic biscuits - The next time you make your favorite biscuit recipe, add a teaspoon to the dry ingredients for a unique biscuit that pairs well with picnic foods like fried chicken. Brownies - Add a teaspoon of five spice powder to dark chocolate brownies. Chocolate and spice pair surprisingly well together, and the seasoning will give the brownies a unique flavor. Soup - Add 1 teaspoon per 2 cups of chicken noodle soup. Apple pie - Use it in lieu of the cinnamon called for in your favorite apple pie recipe. Oatmeal cookies - Add 1/4 teaspoon to your next batch of oatmeal cookies. Hot drinks - Mix a teaspoon with 1 cup of mulled cider or hot coffee for an extra warm drink. Frosting - Add 1 tablespoon per 2 cups of butter cream frosting for spice cake, zucchini bread, or a similar spice bread. There are few seasonings that are this easy to make and so versatile that they can be used in desserts, meat, and authentic ethnic cuisine. With a few ingredients from your local store, you are well on your way to exciting meats and desserts. Give it a try tonight.